Since Friday, I've gotten the rest of the foot, the heel, the heel flap and a few round of the leg knit up on my Maeva sock. I've broken the yarn and started at the toe of the second sock. The pattern calls for 400 yds of yarn, and I only have 360 yds. In the interests of having two socks the same length, I decided now was a good time to start the second sock. Once I bring this one to the same point as the first, I'll divide the remaining yarn in half and knit the leg as far as I can go. Hopefully far enough, as short woolen socks don't make very much sense to me. I'm loving the way this pattern looks. I found the heel flap instructions rather lacking. From looking at the photos I assumed that the heel flap is joined to the foot as it's knit. However, other than an ssk at the end of knit rows and a p2tog at the end of purl rows there is no indication that this is actually what you are doing. To make it work for me, I put half my heel flap sts on two different needles and included 16 instep sts with them. As I came to the end of a heel flap row, I ssk'd one of the heel flap sts with one of the instep sts, then turned my work and followed the chart to the end of the purl row where I p2tog'd a heel flap st and an instep st. This seems to have given me the same result as the patterns photos. It could just be me. This is the first time I've made a sock with this type of construction. I know there are a lot out there, but I've never really looked at them. It could be that this process is widely known. Fortunately I was still able to make the sock work and it fits beautifully so far. 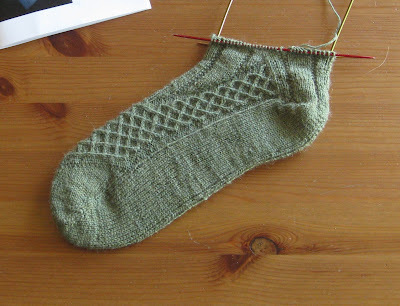 that sock is looking so gorgeous, I love the Celtic style of the twisted stitches. I'm not up on all my sock construction methods, but there certainly do seem to be a lot of them out there.